As a result of using several cameras, I have numerous duplicate file names before I realized my situation. It was OK as long as I used the existing catalog. I strongly desired to make a completly new catalog. After establishing the new catalog, I get a listing of all the duplicate file names that were not imported. There are hundreds of duplicate files involved. This would be OK if I could print out the duplicate file list so I can search out and fix my duplication problems, rather than just having the list with rather comlressed file names, and only a few lines at a time. One idea is to allow duplicates upon import, then rename all files to include camera designation, or following some other convention that would not result in duplicates. Not sure the original premise is correct. 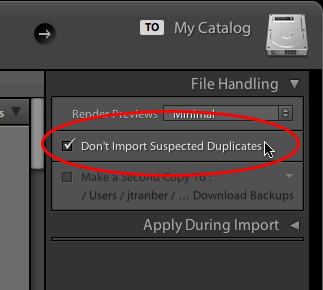 With that 'Suspected Duplicates' setting checked, Lightroom should happily import files with the same file name provided they're not actually duplicate files. To be a suspected duplicate a file has to have more than just a duplicated name....it also has to have the same capture time and have the same file length as another. I've just imported three different files with the same file name quite happily. So I think the initial assumption that the problem relates to differing cameras shooting with the same name format is likely not the problem. It's probably much more likely that somewhere along the way some of your files have actually been duplicated, and that's what Lightroom is detecting when trying to import into a clean catalog. In which case, running the import with that setting unchecked IS going to lead to a catalog full of duplicate files, and not necessarily a set of unique files that happen to have some matching names. If I'm right, you might want to go look at the import source to try to figure out where these duplicates exist, i.e. has Lightroom imported the 'correct' version? Camera serial number is probably the best way to distinguish photos from the same sort of camera taken around the same time. You can use this to create parallel folders, or intermix them in dated folders. Or whatever you do. Computing check-codes over image data, and comparing them to incoming. Such check-codes are already being computed for DNG, but could be computed for all file types. If same image data, it's a duplicate, otherwise - it's not. Not only good for duplicate checking, but also image integrity. Use date-time-original's sub-second when available - if same serial number, then hi-rez capture timestamp conclusively determines whether duplicate or not. Use folder-number and image-number in conjunction with camera serial number. Of course all of this depends on such metadata being available, but IMO should be used when it is. PS - File-size seems like a bad thing to use for duplicate checking, since saving embedded xmp etc. changes file-size, even though image is a duplicate. I have also several cameras, and had the same problem. I use the camera model and a sequence in the file_name, and I have one folder for each day. I prefer filenames that are completely unique within a catalog, and unique across all catalogs too. There are probably no other photo filenames on the planet that are the same as any of mine - I could export all my photos into one flat folder and there would be no conflicts. If I send someone a shrunken photo in an email, without renaming, all I need back is the filename to uniquely identify the photo, and send them a hi-rez version, even 10 years later - no ambiguity..